Are you looking to buy a portable hot tub? Well, you’re definitely at the right place! 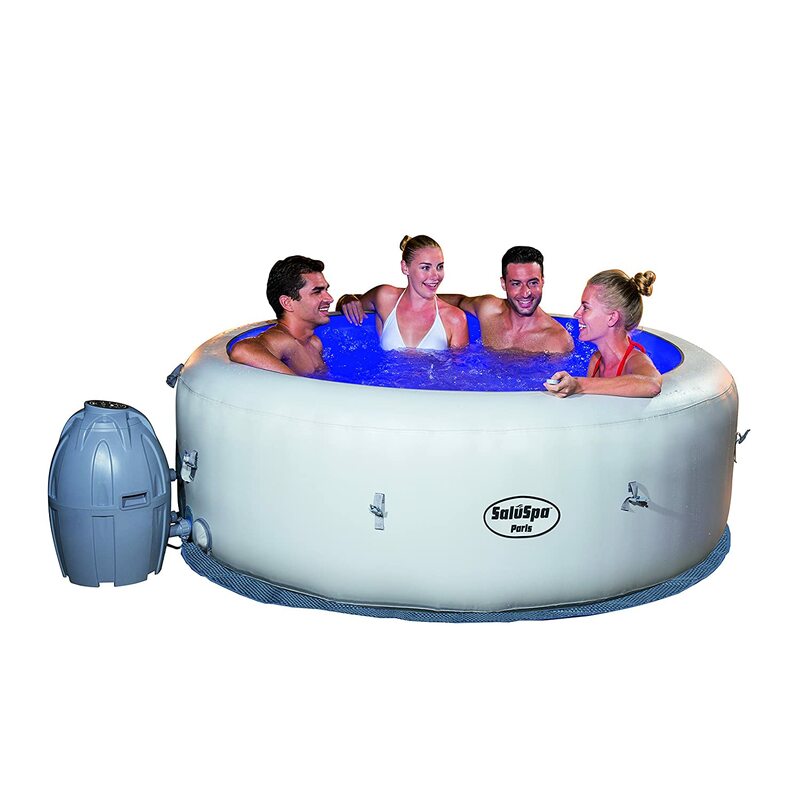 We’ve used and tested truly large number of inflatable hot tubs so that you don’t go around in circles, trying to find the best one. We’ve checked each and every product for their construction quality, power, ease of use, and other features that separate them from the crowd. Of course, we’ve also picked out the best inflatable hot tubs keeping in mind the pricing factor. And we promise that you can remain certain every one of them are worth their dollars. So, what are our top picks? Let’s find out. What to look for when purchasing an Inflatable Hot Tub? Intel recreation corps manufactures this beautiful recreational spa experience. This blow up hot tub is designed with care and precision. It comes with fibre tech construction around the circumference which enhances its structural rigidity. Also around its circumference you’ll find high strength fibres that have been laid out on top of the supporting ridges. 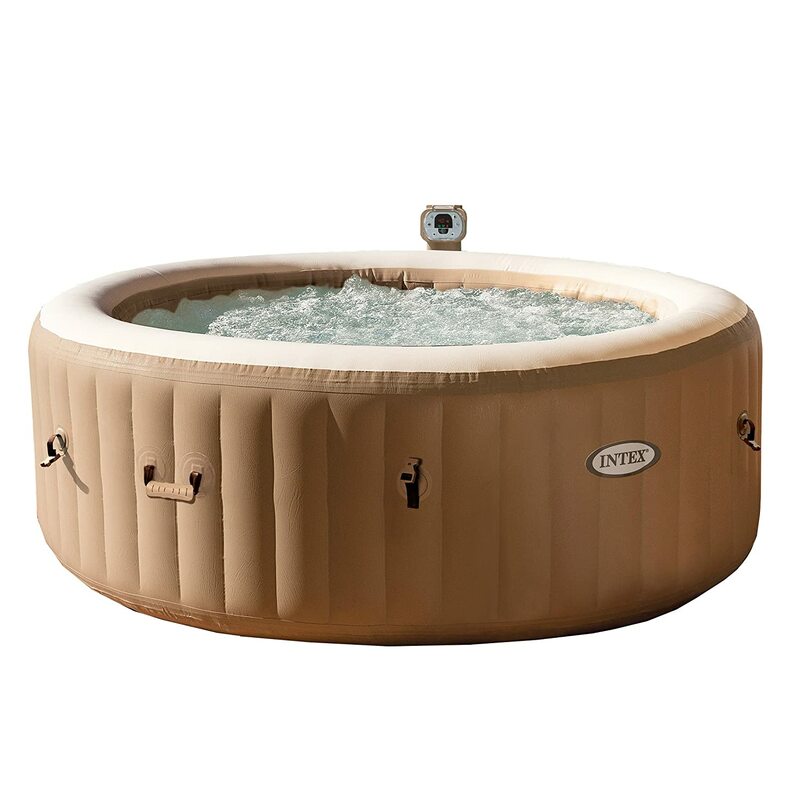 You may not find other hot tubs in this price range, which can easily support your weight. Now what good is a hot tub if it cannot give you a calming massage experience? It is for this reason that 120 high power jets of bubbles have been installed which make sure the water which reaches your skin is smooth and undulating to the touch. There is one hard water treatment built in, which ensures that water is soothing on the skin. Because this hot tub uses laminate fibre structures, it’s essentially puncture resistant against a variety of things one might encounter in the house. It comes in two variants, one, of 4 people, and the other for 6. They also provide you with carry bags and locks, in case you want to move your spa experience to someplace else. The maximum temperature attainable for this product is 104 degree Fahrenheit. We, however, recommend that you make sure that the outside temperature is at least 50 degrees Fahrenheit. Some accessories usable with this hot tub are Intex Cup Holder and Intex Headrest. Coleman has created a great hot tub for use in recreation. We really enjoyed reviewing this product. Do you know what makes this product stand out? Cushioned air pad floor and digital control panels! All the controls are just a touch away. As for its structure, this hot tub employs TriTech fibre technology that supports its weight around the circumference. You will also find the I beam construction, something similar to the first tub that we recommended. The I beam section is necessary because it does a good job of dispersing the stress around the tub, allowing you to sit on the side, without the structure bending and giving away. We don’t want the experience to be a bad one, do we? The exterior is designed to last. We were pleasantly surprised to see PVC layers and a leathroid layer of tritech fibre forming a composite. These two, when combined with each other, ensure a solid built quality for your precious tub. And of course, it comes with a pump and various capacities, from 4 to 6 people. Filling the Coleman hot tub and draining it is really easy. We had no trouble with a garden hose for the same job. It uses around 1.25 kW, although high, but the steady state consumption is far less. 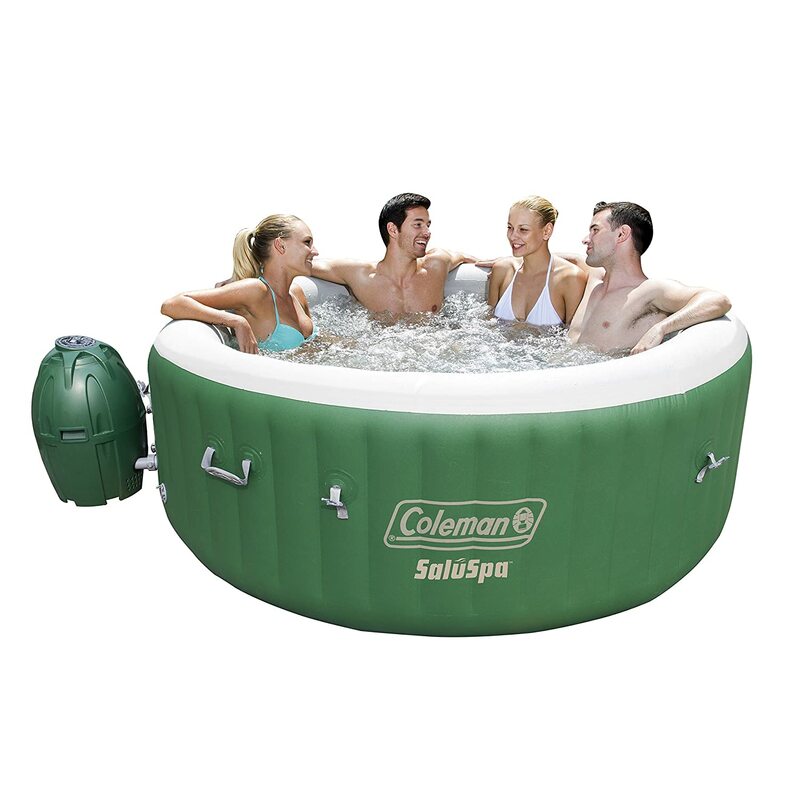 The Coleman SaluSpa, discussed above, was a Bestway product. It, however, was licensed by Coleman. But the palm springs jet is manufactured and licensed by bestway. It features almost all the technologies found in the coleman brand, and then some. We have noticed that it is easy to operate a hot tub when the controls are digital. And bestway doesn’t disappoint us. Armed with digital controls, your relaxing spa experience is just a touch away. There is more, the ever so trusted tritech fibre technology makes its presence known here too. Combined with an I beam shape, the structure feels sturdy and resilient as ever. This eliminated unintentional dents and bents in the structure and the fabric. We loved the extra PVC layering in the coleman saluspa, and we are happy to report that the same added layer of assurance is employed here too. This, when working in tandem with the tritech fibres of reinforced material, offers extra durability and strength that is absent on hundreds of hot tubs which we rejected. Another quite convenient feature that we came across, was the air padding in the floor. This not only minimises the loss of heat by giving an excellent layer of insulation, but also guarantees a comfortable experience. It comes for 4-6 people, has a motor pump for inflating, and a set up guide in a DVD. Next on our list is the Lay-z spa miami hot tub. We loved reviewing it. Why? Just look at all the creativity involved in naming it. Lay-z. How cool! Once you get into the hot tub, you feel the comfort of air padded flooring. The soothing bubbles of air jet, rush onto your feet and your back, and relieves the spasmodic pain in your muscles. The air padded flooring works wonders in insulating the floor and keeping the heat intact for you to enjoy. It can get very comfortable inside. For strength, it uses the standard tritech polymers with multiple layers of PVC. The PVC is laminated for solid protection against jerks (no pun intended) and bumps. We tested it with the most lively of kids, it stood its ground, and passed with flying colors. Add to that the fact that the material doesn’t puncture easily, which makes the tub convenient to move and have a portable spa experience almost anywhere. And on top of that, it comes with inflatable covers to keep the water warm and prevent any debris from entering. Also provided, are filter cartridges and chemical floaters to keep your pool fresh and clean as ever. One of our absolute favourite is the Bestway SaluSpa Paris Airjet. Why? This is the only hot tub that has LED lights. Great work on aesthetics Bestway! The LED has the capability to show at least 6 different colours in a cycle. Available in a light blue colour, it soothes the eye and relaxes the mind for a great spa experience. We really liked the built because it employs the industry standard of tritech polymer fibres that act to enhance strength and toughness. It also uses the PVC laminate to further enhance the strength in the most testing of conditions. The material is further reinforced with an I beam fibre arrangement that prevents any unintentional dents from appearing. What pleasantly surprised us was the steady state power consumption. The motor uses around 1 kW of power while pumping and inflating the tub and heating the water. But, after a while, the power consumed was minimal. And of course, the cushioned air padded floors give you excellent insulation and comfort. This tub is also compatible with several accessories like a headrest and a cup holder. Getting a hot tub can be a challenging decision! All because of the variables involved and factors to consider. Do you go for a cheap inflatable or buy a rather expensive model with many features? But we have done that for you already. Here are some factors that you should keep in mind to find the one right for your needs. 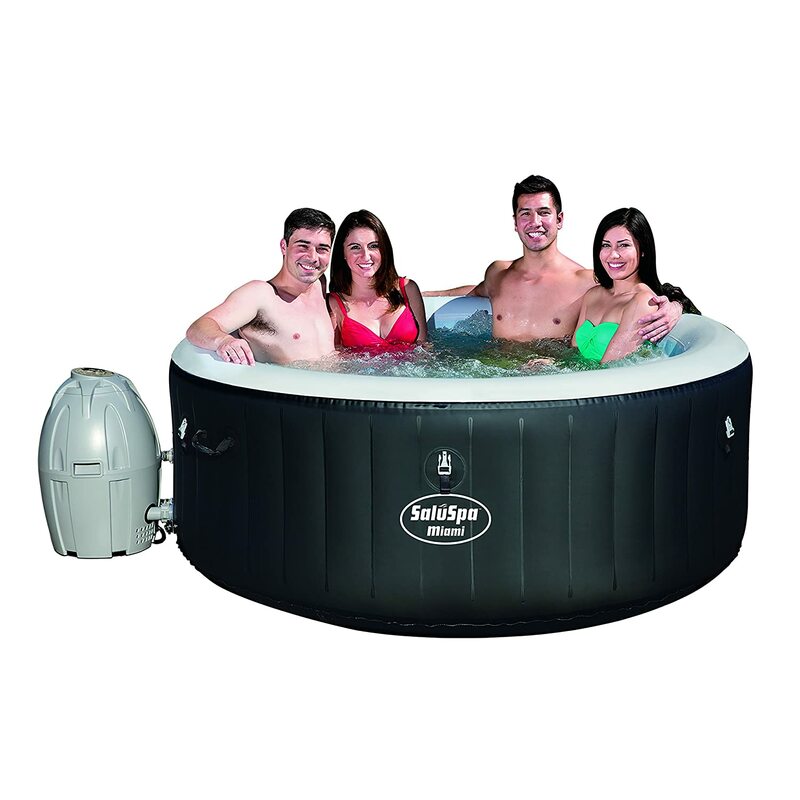 Inflatable hot tubs or spas can come across a broad spectrum of price range. From $300 to $1000 dollars, there are lots of options for you to find and choose from. In our experience, price and features follow an inverse relationship, higher the price, more the features and vice versa. We recommend you to choose wisely from your needs, and try to neglect your want as much as possible if you are on a tight budget. Features like LED mood lighting, and saltwater system might not be worth it for some people. The cheapest option that you have is an air jet. Why is it so cheap? Because the same blower which inflates your tub, is also responsible for providing air to the rings in the floor. These rings are engraved into the floor, from where the air bubbles leak out and provide a tingling sensation and massage to your body. One disadvantage of air jet is that it can be pretty loud. So you must decide what can you live without. The more expensive option of the two is water jet. Water jet tubs need more powerful motors to pump the water. The advantage that these tubs offer, is that pumped water provides a more focused massage on the body. The power is more but it is concentrated. When combined with hot water, they have been known to heal severe sore muscles. Also, for the decibel hating folks, water jets are quite silent in operation. The minimum size for hot tubs is 2 people and maximum can be 6. Going by the water capacity, it ranges from 150 gallons to 300 gallons. Thus by weight, they can go north of 2500 pounds. Therefore, it is wise to judge the foundation before placing these tubs on one. We recommend that you buy tubs wherein the heater and blower unit is built in on the side walls. This is because you may or may not have enough space to keep them separately. It’s an unwritten rule that the cheaper a product is, the more lacking it is in features. So choose your tubs accordingly. Here are some features that you may want to consider. These systems are present to prevent the formation of lime scales in your tub, which if not checked, can lead to failure of pumps and pipes. Not a necessity for all, but if these lights please you aesthetically, we say go for it. It can indeed add to the ambience that you are trying to create in your home spa experience. Who likes the stench of chlorine in water? We know we don’t. This is another feature you could consider as it saves you a ton of time by eliminating the need for chlorination of your tub. This is especially useful for people who have difficulty breathing in chlorine. Well, that’s about all we got to say about inflatable hot tubs. 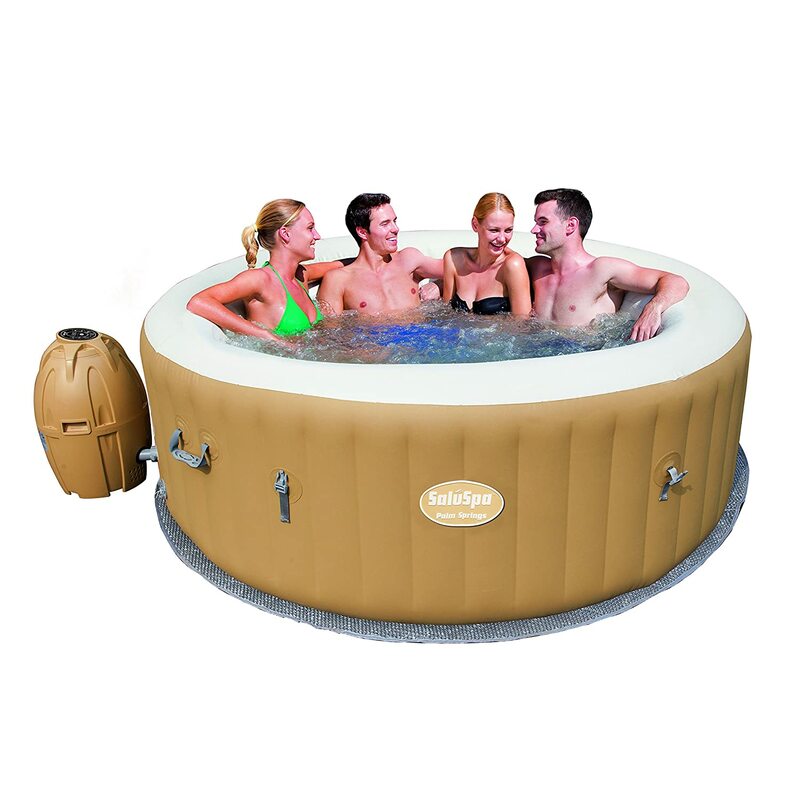 We hope you found our best inflatable hot tub reviews useful and they help you decide which product to buy. If you have any questions, don’t hesitate to leave a comment below! Next articleBest Pool Filter to Buy: 2018 Definitive Guide!